Strandow, Daniel, Michael Findley, Daniel Nielson, and Josh Powell. 2011. 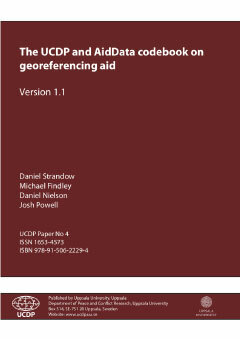 The UCDP-AidData codebook on Geo-referencing Foreign Aid. Version 1.1. Uppsala Conflict Data Program. Uppsala, Sweden: Uppsala University. The data include more than $10 billion in AfDB Group funding to 43 African countries. AfDB’s Quality Assurance and Results Department (ORQR) collaborated with AidData, through Development Gateway, to bring to light valuable geospatial information previously buried in lengthy project documents.